Update Monday: Seems like flights are leaving on schedule. Passengers are advised to call their airlines before heading for the airport, to make sure their flights are leaving on time (this is good practice whether or not there's volcanic ash floating about). “In total, around 13 departing and 12 arriving flights were affected. We immediately deployed additional ground staff to assist passengers with information and to provide support to the airlines. We also increased staff at the security check point in order to make sure people passed through quickly once the flights were back up and running. Through our Airport Management Centres at the three main international airports, we ensured that all parties took decisions in a collaborative manner and were able to quickly respond as and when required.” said Deon Cloete, The General Manager of Cape Town International Airport. Kulula and SAA cancelled a number of flights to and from Cape Town, Port Elizabeth and East London as a result of the eruption of the Puyehue-Cordon Caulle volcanic complex in Chile. Puyehue is part of the Andes Mountain range and is over 2200m high. On the 4th June 2011 Puyehue started spewing volcanic ash 10,000m into the sky. Kulula also cancelled 2 flights to Cape Town. Passengers with onward connections in Sydney will be rebooked once the flight has departed from Johannesburg. - Canberra and Melbourne operations have resumed. - Sydney still planned to resume 14h00 (local time). Please note that the ash cloud movements continue changing and it is very difficult to provide accurate updates. Check the status of your flight before travelling to the airport. If you booked through a travel agent, tour operator or other carrier please contact them directly. If you are affected by flight cancellations, you can choose to rebook on an alternative flight or claim a full refund. - Rebook to the same destination at a later date. - Refund the ticket to the original form of payment - admin fee to be waivered. - Rebook onto another South African Airways flight at a later date at no extra charge and subject to availability in the same booking class. - Cancel your booking and claim a full refund to the original form of payment - admin fee to be waivered. time at no additional charge. South African Airways (SAA), advise customers that our flight operations to Perth for today , Tuesday 21 June will be maintained as per our schedule. SAA with Qantas will continue to closely monitor the situation and customers will be advised accordingly. South African Airways (SAA) advises customers that our flight operations into and out of Cape Town, Port Elizabeth and East London, that were disrupted due to Volcanic Ash on Saturday, 18 June and Sunday 19 June, have returned to normal schedules, as of today Monday, 20 June 2011. SAA will continue to closely monitor the situation and customers will be advised accordingly of any changes. South African Airways (SAA) advise customers that we will maintain our flight schedules into and out of Cape Town, Port Elizabeth and East London for this evening , Sunday 19th June 2011 and tomorrow morning , Monday 20 June 2011, subject to any change in flight circumstances. SAA will continue to closely monitor the situation and customers will be advised accordingly. For further assistance with flight rebooking please contact the SAA Call Centre or your Travel Agent. It is recommended that passengers do not go to the Airport , unless they are in possession of a confirmed flight reservation to or from Cape Town , Port Elizabeth and East London for today Sunday, 19 June 2011 and tomorrow morning Monday 20 June 2011. The safety of all South African Airways (SAA) customers will not be compromised, and the airline has elected to cancel flights only as a safety precaution. All customers are continuously advised of the situation and will be accommodated on the next available flight. For the remainder of today, Sunday 19 June 2011 , we will maintain the flight schedules into and out of Cape Town, Port Elizabeth and East London subject to any change in flight circumstances. SAA will continue to closely monitor the situation and customers will be advised accordingly. For further assistance with flight rebooking please contact the SAA Call Centre or your Travel Agent. It is recommended that passengers do not go to the Airport , unless they are in possession of a confirmed flight reservation to or from Cape Town , Port Elizabeth and East London for today Sunday, 19 June 2011. South African Airways (SAA) has only cancelled the following flights between Johannesburg and Cape Town for today , Sunday 19 June 2011. The safety of all SAA customers will not be compromised, and the airline has elected to cancel these flights only as a safety precaution. All customers are continuously advised of the situation and will be accommodated on the next available flight. For the remainder of today Sunday 19 June 2011, SAA will maintain the flight schedules into and out of Cape Town, Port Elizabeth and East London subject to any change in flight circumstances. SAA will continue to closely monitor the situation and customers will be advised accordingly. South African Airways (SAA) advises customers that all flight departures for today Saturday, 18 June, to and from Cape Town from 17h45, Port Elizabeth from 17:15 and East London from 17h05 onwards have been suspended due to ash clouds. The Cape Town to London flight (SA220) scheduled for departure tonight from Cape Town will night stop and depart tomorrow morning as SA9220 at 08h00. All affected flights will be closed for sale for this evening. Customers scheduled to depart on these flights are advised NOT to go to the airports. Customers are advised to contact SAA or their travel agent. Further to information provided yesterday, Airports Company South Africa would like to advise all passengers that flight operations are returning back to normal. ACSA wishes to advise travelers that despite flight operations returning to normal there could be rotational delays on certain flights as the backlog is being cleared. To support the airlines ACSA has deployed additional staff on the ground in order to assist passengers where necessary. ACSA has also increased staff at the security check point in order to make sure people pass through quickly and through its Airport Management Centres at the three main international airports, ACSA is ensuring that all parties make decisions in a collaborative manner and that we are all able to quickly respond as and when required. ATNS is constantly monitoring the situation with the Toulouse Volcanic Ash Action Centre (VAAC) and is regularly updating airlines. Passengers travelling today and in the next few days are advised to contact their airline in order to confirm their flight details before going to the airports. All airport role players are working together to help minimise the inconvenience to the passengers. At this point in time the areas affected by the Volcanic Ash Cloud are the Cape Town coastal areas up to East London and Port Elizabeth, whilst inland the risk is low to medium and weakening. The Ash Cloud is riding the Frontal Cold Weather System and is closely linked to that movement. The system is characterised by heavy rain and strong winds. Currently the Ash Cloud is from surface to 20 000 feet and in some places it is at 35 000 feet and the density varies. ATNS will continue to work closely with the airlines and the Airport Authorities to ensure the optimum and safe use of the airspace. ACSA and the Air Traffic and Navigation Services Company are monitoring the situation and will update travelers as and when new information becomes available. Saturday, June 18, 2011 | 00:00 Airports Company South Africa would like to advise all passengers travelling today and in the next few days to contact their airline in order to confirm their flight details as volcanic ash has been sighted in the Cape Town airspace and has impacted various flights in and out of Cape Town International, Port Elizabeth and East London airports. Other airports will be affected as well. ACSA and the Air Traffic and Navigation Services company are monitoring the situation and will update travellers as and when new information becomes available. are currently monitoring the Volcanic Ash situation. forecast is expected at 14h00. manner according to international standards. Volcanic ash from a Chilean volcano which has travelled around the world and may start affecting some flights in southern South Africa and may also affect air traffic for the next few days. 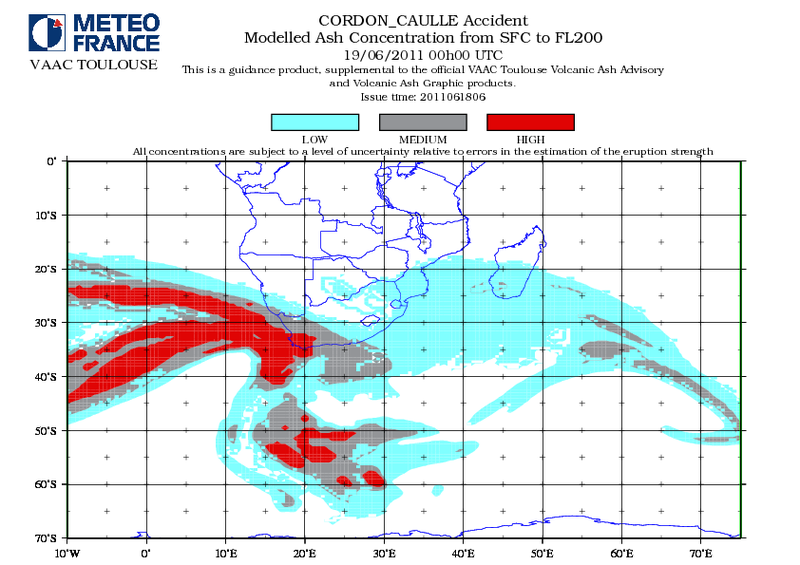 With the assistance of the Volcanic Ash Advisory Center (VAAC) Toulouse and South African Weather services (SAWS), Central Airspace Management Unit (CAMU) is closely monitoring a large volcanic ash plume resulting from the eruption of Cordón Caulle in Southern Chile on 4 June. The initial eruption was estimated to reach a height of 50,000ft (15 km), with eruptions still continuing to 30,000ft (9 km). While the main ash cloud is expected to pass to the south of the African mainland it has reached airspace in the Cape Town FIR and Johannesburg Oceanic Airspace. The Current density of the ash cloud is low. Crews have reported the ash as smog or smoke with a smell of smoke while flying through. The northern edge of the cloud is expected to reach Namibian southern border, De Aar, and towards Durban, but it is also diffusing. 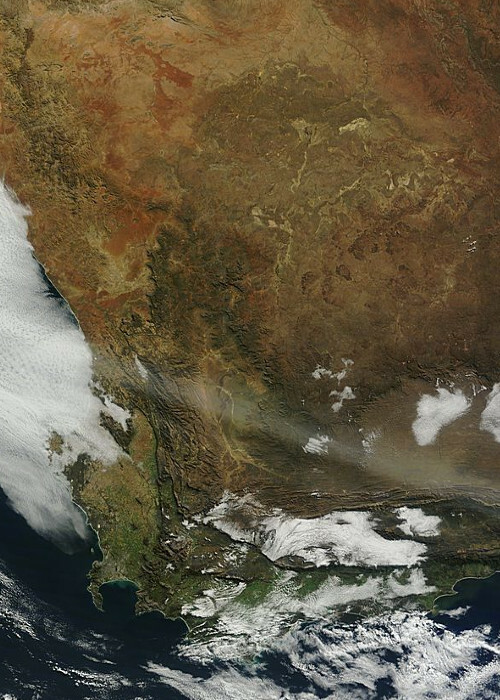 This part of the ash cloud is not expected impact the Johannesburg FIR for the moment, but other parts of the ash cloud are being closely watched in case they move over South Africa. Volcanic Ash Advisories have been issued by Toulouse, Darwin and Wellington Volcanic Ash Advisory Centres (VAACs) for ash clouds which extend over parts of the Atlantic Ocean, southern Africa, the Indian Ocean and Southern Ocean. ATNS’s Air Traffic Flow Management (ATFM) Specialists in the CAMU are working with airlines to minimise disruption by providing advice and if required rerouting advice to aircraft wherever possible through area control centres. CAMU will release updates regularly to the Industry. Due to the current low density predications of the ash cloud, the decisions on whether or not flights will operate will be made by individual airlines and operators. Detailed information on the volcanic ash cloud is being provided to the airlines, SACAA and ATNS by the VAAC Toulouse. The airlines will make decisions on how flights operate based on a careful assessment of this information. If the ash cloud becomes denser, then the SACAA will assess the situation and may close parts of the airspace in collaboration with CAMU. For the latest information refer to the VAAC Toulouse website. This contains current maps and forecasts of ash movements in relation to the African Continent.